Are you a hobby woodworker, or maybe you just have a small woodworking business. 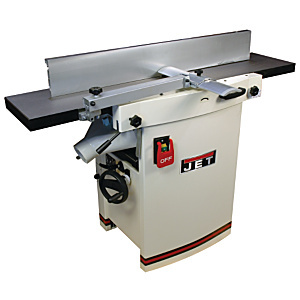 The new JET JJP12 12-inch Jointer/Planer might be the perfect tool for you. Sure it is ideal to have both a jointer, and a planer in your shop, but not all of us can afford such things, or even have the room to house them. In the past you would have had to choose one or the other. The Jet JJP12 can joint and plain at a width of 12 inches, and features a long 55 in table to accommodate your longer pieces of wood. The dual-purpose machine uses a 2-1/2 inch diameter three-knife cutter head, which spins at 5500 rpm for both jointing and planing. It has a max jointer cutting depth of 1/8 inch, and a max planing depth of 5/32 inch. The JJP12 is powered by a 12.5 amp 3 HP single-phase TEFC (totally enclosed, fan cooled) motor, and is housed in a welded-steel base cabinet. Changing from jointing to planing is fast and easy. A pair of locking levers on the cabinet’s sides, release the jointing deck, which can then be lifted to its upright position. Spring-assisted hinges make the conversion even easier by counteracting the table weight. The operator then rotates the dust collection shroud with its 4-inch port into planing position and engages the feed rollers. Converting back to jointing mode is just as simple, only in reverse. You can pick up the Jet JJP12 at Amazon today for $2000 with free shipping.